This is a squash I harvested today – I believe it’s Rogosa Violina ‘Gioia,’ an Italian butternut, assuming I’m not mixing my vines up. 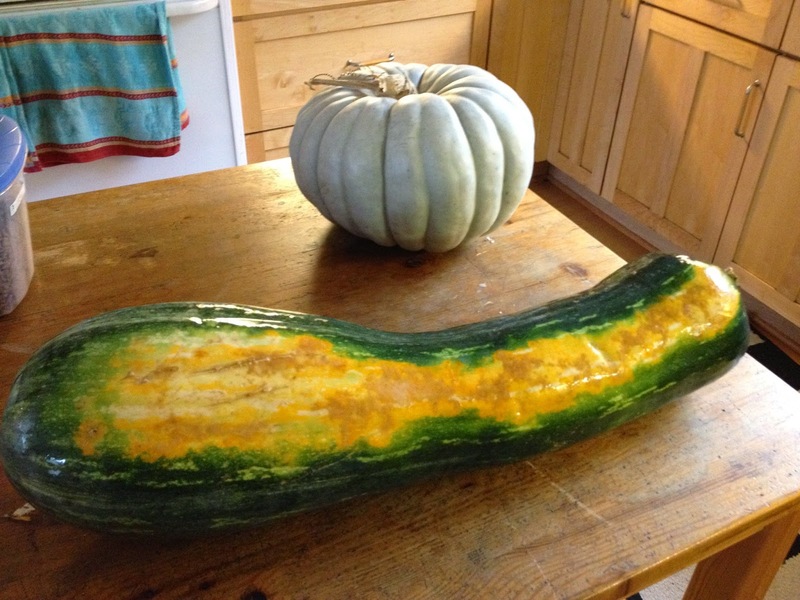 With good-sized Jarrahdale pumpkin (not grown by me) for size comparison. It’s supposed to turn tan all over, but I decided to cut it now due to worry about rotting, and it looks and tastes mature enough inside – a nice orange flesh with a rich squash flavor. I baked slices of it in the oven (two trays worth) and froze the meat for future use. We can make a lot of soup. I’ve also saved a few seeds, even though I did nothing to prevent cross-pollination, and there were butternut plants nearby in the community garden (same species). Even if crossing occurred, the results should be interesting. ← Grow100 Check in Period 3 Winner!